After the record naming rights deal for the entire continent was signed, Allianz gave fans the opportunity to choose future name of Palmeiras new stadium. As expected, Allianz Parque was selected out of three options. Decision was announced yesterday in the afternoon. New stadium, temporarily referred to as Arena Palestra Italia (after its predecessor) will be named Allianz Parque for the next 20 years. The decision comes after a week of online vote carried out in May, which had an amazing attendance of 600,000 voters. 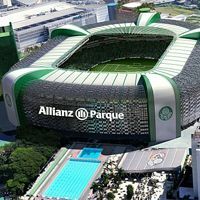 Three options were on the table (Allianz Parque, Allianz Center and Allianz 360), but rumor has it the available options were intentionally chosen to make sure Allianz Parque wins. In the end it did, smashing the remaining two options with 89% voters supporting Parque. No wonder, since this option is also the only one having any reference to Palmeiras’ history, since their previous stadium was nicknamed ‘Parque Antarctica’. The record-breaking naming rights deal sees Allianz insurance group paying R$300 million (€106m / $141m) over 20 years. This amount makes it the best ever deal of this kind reached throughout South America. It also sees Palmeiras grab a hefty share of 20%, equaling R$60 million (€21m / $28m).